A tempeh incubator is a temperature controlled enclosure for making tempeh, an Indonesian soy product. Tempeh is made by inoculating cooked soybeans with the mold Rhizopus oligosporus and letting the mold grow in a warm environment for 24 hours, binding the soybeans in a think white matrix. A tempeh incubator can be as simple as a gas oven with only the pilot light on. However I wanted something fool-proof, a set-and-forget incubator that would guarantee consistent results. This page describes my tempeh incubator, essentially a pine box with two lightbulbs and an industrial temperature controller. It is easy to build from my Google SketchUp model. 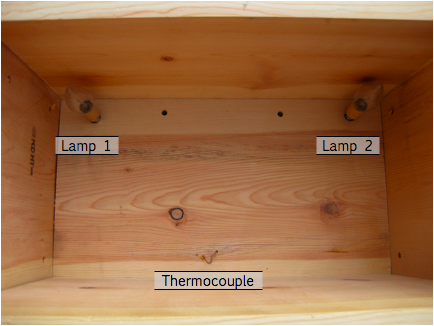 The incubator maintains a temperature of 31°C (the optimal temperature for Rhizopus oligosporus growth) inside the box. The heat source is a pair of smal lightbulbs (10 watts each). The lights are controller by a MINCO CT15 temperature controller. The temperature sensor itself is a type-K thermocouple. The picture at left shows the tips fused together at the sensing end. I bought the temperature controller and thermocouple at an electronics surplus store for $20. In addition to the temperature controller, thermocouple, wires, and lamps, you will need a circular saw, a drill, some screws, and a 1×12 board. I used a pine board because it was the cheapest. Note that a 1×12 board is actually 3/4 × 11 1/4 inches. The SketchUp model of the incubator shows how the 1×12 board should be cut. The incubator was designed to require very little saw work. Note that model shows the incubator top lower than the side walls, however as you can see from the picture, I made the top level with the sides, which meant that the pair of rear walls did not have to be cut to 10 7/16 inches in width. All the pieces are all held together by screws. The front lid may be hinged at the top. It is not attached to the box in my construction. When not in use, the lid is stored inside the incubator as shown above. The following picture shows the interior of the incubator. The lamps are mounted on the rear wall of the chamber as shown in the picture above. 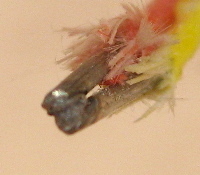 The thermocouple probe sticks out of a small hole about an inch from the bottom. I also drilled some holes in the rear wall of the chamber and side walls for ventilation. I used the directions for preparing the sobeans that came with the tempeh starter I bought from GEM Cultures. Place the containers with the inoculated with Rhizopus oligosporus into the incubator. I make my tempeh in 12×12 inch aluminum pans, punctured for ventilation and covered with aluminum foil, although I've also used small pyrex baking dishes covered with foil. Important: Position the thermocouple so that it is not exposed to the lamp light. I place my aluminum pans on a pair of chopsticks with the temperature probe in the shadow of a pan or towel. This ensures that the thermocouple is not heated directly by the lamps. I also cover the containers with a towel, again, to ensure that the tempeh is heated more evenly. After about 18 hours of incubation, the tempeh will start to generate its own heat raising the temperature above 31°C. As far as I know, this is normal and not detrimental to the tempeh. After 24 to 25 hours, the tempeh will be ready. I suggest taking it out right away to prevent sporulation. Although sporulation is not harmful, I like the look of clean white tempeh. Finally, I steam the tempeh for about 20 minutes right after taking it out of the incubator. Although tempeh can be cooked without steaming it first, steaming eliminates the slight bitter taste. The resulting homemade tempeh is simply extraordinary!